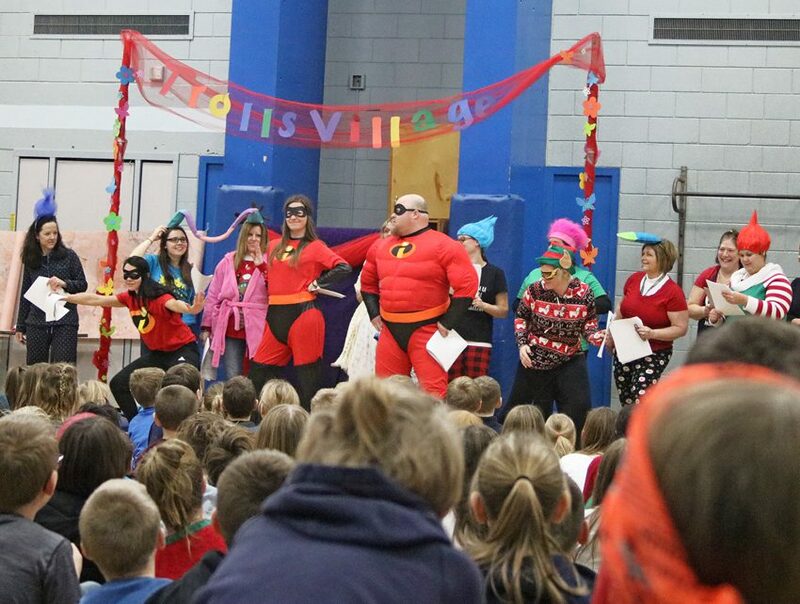 Students and staff at Eden Valley-Watkins Elementary were entertained for about an hour and a half Friday morning, Dec. 21, by the annual staff variety show in the gym. There were Christmas songs, an obstacle course competition, corny jokes, and overall lots of laughter and Christmas-y spirit. Above, three “ventriloquists” control their “dummies” while telling Christmas jokes. The skit involved Santa being kidnapped and the Trolls coming to his rescue. 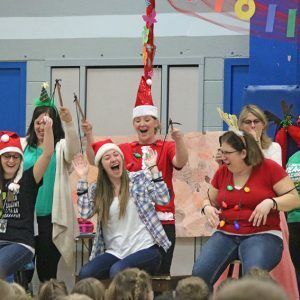 The program ended with all staff holding hands to encircle all the students and singing to them “We Wish You a Merry Christmas.” What a fun and wonderful way to send students off early for Christmas break. Staff photo by Jean Doran Matua.